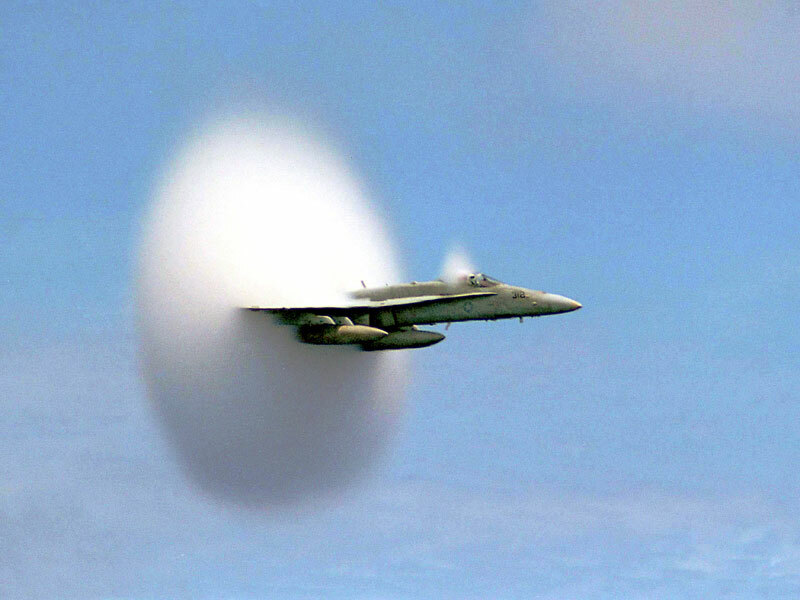 Explanation: Is this what a sonic boom looks like? When an airplane travels at a speed faster than sound, density waves of sound emitted by the plane cannot precede the plane, and so accumulate in a cone behind the plane. When this shock wave passes, a listener hears all at once the sound emitted over a longer period: a sonic boom. As a plane accelerates to just break the sound barrier, however, an unusual cloud might form. The origin of this cloud is still debated. A leading theory is that a drop in air pressure at the plane described by the Prandtl-Glauert Singularity occurs so that moist air condenses there to form water droplets. Above, an F/A-18 Hornet was photographed just as it broke the sound barrier. Large meteors and the space shuttle frequently produce audible sonic booms before they are slowed below sound speed by the Earth's atmosphere.